Jennie M's Stampin Spot: Thankful Card for Three Challenges! I managed to get three challenges on this card. Splitcoast Color Combination #655 here. The colors to use are Early Espresso, Peekaboo Peach and Lemon Lime Twist. Second, is the Global Design Project#107 Theme-Grateful, here. 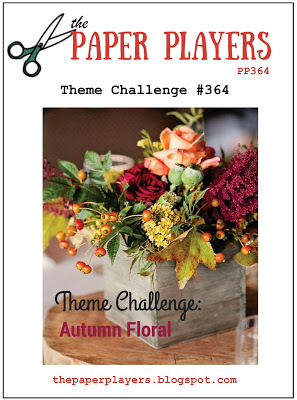 And finally, The Paper Players#364 Autumn Floral Theme, here. SO pretty! Love your little autumn tree!! Thanks for playing along with us at The Paper Players.